Is Africa large enough for India and China? 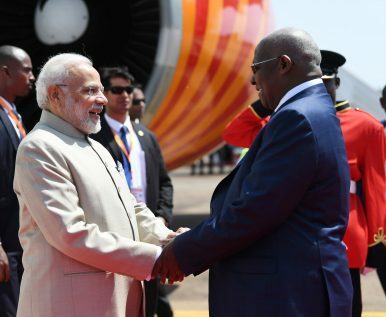 Prime Minister Narendra Modi kicked off the first leg of his three-nation Africa tour with his visit to Rwanda, the first-ever by an Indian prime minister to the country. Announcing that India will soon open its mission in Rwanda, Modi extended a $200 million line of credit to the East African nation. He also participated in an event on “Girinka” (one cow per family), a national social protection scheme of Rwanda, by gifting 200 cows. He will be visiting Uganda and then travel on to South Africa for the BRICS summit in Johannesburg. The Modi government’s outreach to Africa has tried to build on India’s traditional ties with the continent. India’s links with Africa are centuries old, bolstered by trade across the Indian Ocean and a million-strong diaspora across Africa. Shared colonial legacy and post-independence development experience has framed India’s relationship with Africa. India’s role as a champion of anti-colonialism and anti-racism after its independence in 1947 drew it closer to the African nations. India emerged as one of the most vocal critics of apartheid in South Africa. New Delhi under its first prime minister, Jawaharlal Nehru, became a votary of strong Asian-African solidarity. Despite being on the peripheries of global politics during the Cold War, India emerged as one of the strongest proponents of the independence of African states from colonial subjugation and a supporter of South-South cooperation in order to challenge the inequities of global political and economic order. But India’s substantive presence in Africa remained marginal as it remained focused on its own periphery through much of the Cold War period and its capabilities remained limited. Since the end of the Cold War and propelled by China’s growing profile in Africa, India is re-invigorating its ties with the African continent. And the Modi government has tried to give the region sustained attention instead of the episodic outreach of the past. The end of the Cold War presented new opportunities for India to interact with Africa differently. There were new challenges for India that had to be managed. India’s rapid economic growth needed new markets and access to resources. As a result, economic engagement with Africa has become central to India’s new approach. This is related to India’s search for energy security in which Africa is playing an increasingly important role. India is seeking the diversification of its oil supplies away from the Middle East and Africa will be playing an important role in India’s energy matrix. India is now giving sustained attention to Africa, opening diplomatic missions on the continent as well as regular high-level political interactions. India is promising loans on easy terms to those nations willing to trade with India and is contributing to education, railways and peacekeeping. India has substantially increased its aid and assistance to African countries as well. India’s partnership with Africa is wide ranging and is now focused on human resources and institutional capacity building. It is building economic and commercial ties with Africa even as it is contributing to the development of African countries through cooperation and technical assistance. The Indian Navy is also engaged in dealing with pirates off the coast of Somalia. It has been patrolling the waters of the Indian Ocean and helping countries in Eastern and Southern Africa in tackling piracy and surveillance of their exclusive economic zones. India has sought the cooperation of African states in the Indian Ocean littoral to establish mechanisms for cooperation in order to deal with threats to regional security including terrorism and piracy. The trade balance between India and Africa is in the favor of the latter as African countries export more goods to India than it imports. This is partly a result of India’s duty-free tariff preferential countries (LDCs) launched in 2008, which has benefited 33 African states. India wants a “developmental partnership” with Africa to be the cornerstone of its economic ties with the region. This also allows India to differentiate itself from the principles on which countries belonging to the Organisation for Economic Cooperation and Development (OECD), the traditional donors of foreign aid, have based their relations with the recipient nations. But Indian private sector is yet to take full advantages of the opportunities offered by Africa despite having a better understanding of the African market compared to China’s state-owned enterprises. Additionally, India is investing in capacity-building, providing more than $1 billion in technical assistance and training to personnel under the Indian Technical and Economic Cooperation (ITEC) program. As a full member of African Capacity Building Foundation (ACBF), India has pledged $1 million towards the ACBF’s sustainable development, poverty alleviation, and capacity building initiative. India has invested $100 million in the Pan-African E-Network to bridge the digital divide in Africa, leveraging its strengths in information technology. Indian military academies offer training to military officers from a number of African states. Though India continues to value its close ties with some Eastern African nations, it is also investing diplomatically to reach out to African states in the southern and western regions of the continent. India has been holding India-Africa summits to reach out to all African nations. The cooperation framework agreed at these summits and the Indian initiatives to scale up investment and aid to Africa have underscored India’s aim to foster a robust partnership between New Delhi and the African continent. Indian diaspora’s presence in the African continent in significant numbers has given India a significant stake in the continent. They are now considered a significant base for the expansion of trade and commerce. As Modi reiterates Indian commitment to the future of Africa, he would be fully aware that another head of the state, China’s Xi Jinping, is also wooing Africa even as the two will be coming together for the BRICS summit. New Delhi will need to start delivering on the ground if the India-Africa partnership has to move beyond high level visits. The South African president’s slated arrival in New Delhi as the Republic Day chief guest presents an opportunity. African Raw Materials and India’s Quest for Great Power StatusModi’s Africa Visit: Toward Greater Cooperation in Maritime SecurityLong Overdue: India Gets Serious About AfricaPakistan’s Economic Woes: The Way ForwardIndian Elections 2019: Do Narendra Modi and the BJP Deserve a Second Term?